SUMMARY: Many people who suffer from bad breath are urgently seeking the reason for their bad breath. There are many theories about how bad breath arises and one common myth is that it comes from the stomach, but this is just a myth it is not fact. The truth is that the majority of bad breath comes from the back of the tongue. However, there is a connection between your tonsils and bad breath too. Many people who suffer from bad breath are urgently seeking the reason for their bad breath. There are many theories about how bad breath arises and one common myth is that it comes from the stomach, but this is just a myth – it is not fact. The truth is that the majority of bad breath comes from the back of the tongue. However, there is a connection between your tonsils and bad breath too. Before we discuss tonsils and bad breath, you need to have a good idea of whether that is your problem. There is a very small chance that your tonsils are the source of your bad breath. In fact, 80-90% of bad breath is due to bacteria on the tongue and only 3-5% of bad breath is a result of the tonsils. 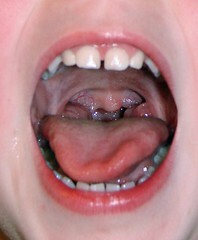 Therefore, before you jump the gun and begin suspecting your tonsils, there are a couple ways to rule out your tongue. Bacteria easily attaches to the back of the tongue since it’s an area that has little activity. Of course, with little activity and in an area that is hard to reach, the bacteria can build and stay there for long periods of time, causing bad breath. To help with this problem, you can get a tongue scraper. You will want to scrape your tongue morning and night to keep it bacteria-free. There are also specially made toothbrushes that you can clean your tongue with. Also, using a germ-fighting mouthwash will also help reduce the amount of bacteria forming. If you do these things and still have very bad breath, then the problem could be your tonsils. As stated before, there is a connection between tonsils and bad breath, but it is very small. In most cases, the connection between tonsils and bad breath is actually from a condition known as tonsilloliths – or tonsil stones. Tonsil stones are created when particles such as bacteria, food debris and post-nasal drip fluids begin to “stick” together. They form little hard balls at the back of the throat. When released, tonsil stones have an atrocious taste and a smell to match, which obviously causes bad breath. One usually can feel tonsil stones and many have reported having the sensation like something is lodged at the back of their throat. Because you can feel the tonsil stones, you can also remove them by scraping them with your fingernails – although this might be painful, using a moistened cotton swab, a soft-bristled toothbrush or even a water pick. While tonsilloliths is one connection between tonsils and bad breath, another is also common. This is when the tonsils become infected. Common forms include strep throat and tonsillitis. The infection causes the odor and the only way to get rid of it is by removing the infection. However, you will need to consult a doctor to do this. Normally, antibiotics will quickly clear up the infection. The best way to prevent bad breath problems from occurring is by using oral healthcare products on a regular basis to keep the bacteria level low.